New Brunswick’s Wild Blueberry output increased significantly from 2012 to 2014 (by 33 million pounds) which led to the building of a new hi-tech processing plant – the first of its kind. Today’s tweens and teens need proper nutrition for bone and muscle development, recovery from sports, cognition, and strong immune systems. Here is a look at some of the nutritional ingredients that may play beneficial roles during these developmental years (8–18 years), including protein, calcium, probiotics, prebiotics, whole grains, omega-3 fatty acids, Wild Blueberries and yeast beta-glucans. Wild foods are gaining popularity in the United States. They’re grown in locations where they happened to simply land an offer more nutrition—with an intense and fuller flavor—versus conventionally grown fruits and vegetables. Expand your palate by giving one of these wild foods, including Wild Blueberries, a go, says Amy Gorin, MS, RDN, who writes a nutrition-focused blog, “The Eat List,” for WeightWatchers.com and is the former Senior Editor of Health, Weight Watchers Magazine, and WeightWatchers.com. Healthy Happy Life.com Going Wild in Maine! 10 Wild Blueberry Facts + My Fave Smoothie. #BlogTheBarrens Trip. Vegan food blogger, Kathy Patalsky had such an amazing time on her recent trip to the Wild Blueberry barrens of Maine. In this blog posts, catch her 10 Wild Blueberry Fun Facts while enjoying an adventure on the barrens, in the town of Bar Harbor and hiking Bubble Rock in Acadia National Park. Kathy also shares her #1 question – what’s the difference between non-organic wild blueberries and non-organic cultivated blueberries? You’ll have to read to find out the answer. Data from almost 400,000 people suggests that consuming berries and the anthocyanins they contain may reduce the risk of type 2 diabetes mellitus by 15-18%. The potential benefits could be linked to the antioxidant properties of anthocyanins in berries. Wild Blueberries have twice the antioxidants of regular blueberries. The Wild Blueberry barrens of Maine served as the perfect introduction to New England that Alexandra Caspero, RD, didn’t know she needed. While Alex crushed on the incredible town of Bar Harbor, Maine, she also fell hard for the Wild Blueberry – eating MORE in the past few weeks than past years combined. (Has she turned blue yet?) Explore how Alex’s barren adventure translates into this delicious Wild Blueberry parfait recipe. Did you know that Wild Blueberries are one of the healthiest fruits you can eat? They have double the antioxidants of regular blueberries, twice the fiber, and eight times the manganese. Because they are WILD, they have never been hybridized. Watch Nutrition Advisor Kit Broihier show us all the different ways you can use frozen Wild Blueberries in your daily meals, starting with smoothies. Vicki Shanta Retelny, RDN, The Lifestyle Nutritionist, gets us to imagine hunting and gathering for our daily nourishment in this blog recap. 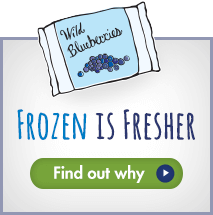 Wild foods are all the rage now and having recently toured the Wild Blueberry barrens and Wyman’s facility on the Blog the Barrens trip, Vicki was able to watch Wild Blueberries be flash frozen right after harvest – locking in their nutritional value. This inspired her to create this tasty, spiced smoothie with Wild Blueberries. Alisa Fleming (and Tony) recently had the opportunity to tour the Wild Blueberry barrens of Maine, and has since become enamored with these wholesome little fruits. Chock full of nutrition, Alisa wanted to create a smoothie recipe where the Wild Blueberry had the chance to shine – not be lost with over-powering flavors. Explore this dairy-free/non-dairy, egg-free, gluten-free, peanut-free, soy-free, vegan, plant-based, vegetarian, and optionally paleo, Wild Blueberry smoothie recipe. According to Carlene Thomas, RDN, LD, you NEED to go to Maine in summer. ESPECIALLY if you live somewhere where summer is hot and humid. In this blog, she geeks out about wild blueberries and falls in love with Bar Harbor, Maine. Carlene loves to explore the home of a food to understand it on a deeper level – the Wild Blueberry is no different. Experience Bar Harbor and the Wild Blueberry barrens through the eyes of Carlene with 10 Things You Need to Do.